Nearly half a million people of Pakistani origin call America home. Pakistani-Americans' education and income levels are significantly higher than those of the general population of the United States. Among them are doctors, engineers, lawyers, accountants, journalists, politicians, business executives, professional sports team managers and owners, artists, actors, entrepreneurs, salespeople, policemen, soldiers, convenience store clerks and taxi, bus and truck drivers. United States is the 5th most popular destination for Pakistani-born international migrants and the 6th largest source of remittances to Pakistan. In addition to participating in local philanthropy and community activities, several Pakistani-American organizations help raise funds for schools, hospitals and other human welfare projects in Pakistan. Over 450,000 Pakistani immigrants and their children live in the United States as of 2013, according to a report compiled by Migration Policy Institute. Of these, 273,000 were born in Pakistan and the remaining 180,000 are US-born. Pakistani-American population has more than doubled in the last decade due to increased immigration, according to US Census data. Pakistani-Americans (pop: 450,000) are the seventh largest community among Asian-Americans, behind Chinese (3.8 million), Filipinos (3.4 million), Indians (3.2 million), Vietnamese (1.74 million), Koreans (1.7 million) and Japanese (1.3 million), according to Asian-American Center For Advancing Justice . They are still a minuscule fraction of the overall US population. 56% of Pakistani-Americans have at least a bachelor's degree, much higher than 33% of Americans with college degrees. Among Pakistani-American college grads, 33% have a bachelor's degree while 23% have master's or Ph.Ds. Median annual income of Pakistani-American households is $60,000, higher than the $50,000 median household income of all Americans. 33% of Pakistani-American households earn at least $90,000 while 18% earn more than $140,000. Pakistan is the third biggest source of foreign doctors who make up a third of all practicing physicians in the United States, according to OECD. Vast majority of Muslim doctors in America are of Pakistani origin. Among them is Dr.Mark Humayun who was awarded top US medal for technology by President Barack Obama in 2016.
is home to 12,000 to 15,000 Pakistani Americans. Thousands of them are working at Apple, Cisco, Facebook, Google, Intel, Oracle, Twitter and hundreds of other high-tech companies from small start-ups to large Fortune 500 corporations. Pakistani-Americans are contributing to what Erik Brynjolfsson and Andrew McAfee describe as "The Second Machine Age" in a recent book with the same title. Pakistani-Americans are the largest foreign-born Muslim group in San Francisco Bay Area that includes Silicon Valley, according to a 2013 study. The study was commissioned by the One Nation Bay Area Project, a civic engagement program supported by Silicon Valley Community Foundation, The San Francisco Foundation, Marin Community Foundation and Asian Americans/Pacific Islanders in Philanthropy. Overall, US-born Muslims make up the largest percentage at 34% of all Muslims in the Bay Area, followed by 14% born in Pakistan, 11% in Afghanistan, 10% in India, 3% in Egypt and 2% each in Iran, Jordan, Palestine and Yemen. Pakistani-American entrepreneurs, advisers, mentors, venture capitalists, investment bankers, accountants and lawyers make up a growing ecosystem in Silicon Valley. Dozens of Pakistani-American founded start-ups have been funded by top venture capital firms. Many such companies have either been acquired in M&A deals or gone public by offering shares for sale at major stock exchanges. Organization of Pakistani Entrepreneurs (OPEN) has become a de facto platform for networking among Pakistani-American entrepreneurs in Silicon Valley. It holds an annual event called OPEN Forum which attracts over 500 attendees. Kumail Nanjiani, a Pakistani-American actor-comedian, recently made news with the successful release of his feature film The Big Sick on hundreds of screens across the United States. It is a cross-culture romantic comedy based on actual events that breaks new ground by casting a brown-skinned Pakistani-American in a lead role in a movie produced and widely screened in the United States. Acquired by Amazon Studios for $12 million after a bidding war at Sundance film festival, the film has already grossed over $36 million so far. Shahid Khan, a Pakistani-American engineer who made his multi-billion dollar fortune in auto industry, became only non-white owner of an NFL franchise team when he bought Jacksonville Jaguars for $760 million in 2011. Major League Baseball's Los Angeles Dodgers franchise general manager is a Pakistani-American named Farhan Zaidi, an MIT and Berkeley-educated economist. Kamala Khan is a new Ms. Marvel comic book character created by Pakistani-American Sana Amanat for Marvel Entertainment. Kamala is both female and Muslim. It is part of the American comic giant's efforts to reflect a growing diversity among its readers. Academy Award winning Hollywood hits Frozen, Life of Pi and The Golden Compass have one thing in common: Each used extensive computer-generated imagery (CGI) created by Pakistani-American Mir Zafar Ali who won Oscar statuettes for "Best Visual Effects" in each of them. Rockefeller Foundation-Aspen Institute Diaspora (RAD) program identified 79 Pakistani-American organizations. Of these, 5 organizations had revenue exceeding $1m while two had over $200,000 in their most recent fiscal year. The top organizations are The Citizens Foundation (TCF), the Association of Physicians of Pakistani Descent in North America (APNA) and the Organization of Pakistani Entrepreneurs (OPEN). Other large organizations are American Pakistan Foundation, Imran Khan Cancer Foundation and Human Development Foundation (HDF). These organization help raise funds for education, health care and other development and human welfare activities in Pakistan. Some Pakistani-Americans, like members of other ethnic and religious minorities, are alarmed by the increasing bigotry in America since the election of President Donald Trump. This is particularly true of places like New York's Little Pakistan were Pakistanis were targeted after 911 terrorist attacks. At the height of the sweep, over 20,000 people in Brooklyn’s South Asian communities left the United States, a COPO survey found, according to Gotham Gazette, a New York City publication. Many sought political asylum in Canada and Australia, and some returned to Pakistan and other countries. A number of them never returned. Many had their legitimate US immigration applications pending at the time. Others had their cases in immigration courts and they were waiting for disposition by judges. With few exceptions, most Pakistani-Americans, making up a tiny fraction of the US population, are thriving. They have significantly higher incomes and education levels than the general US population. Pakistani-Americans are engaged in diverse occupations ranging from doctors, engineers and lawyers to large and small business owners and drivers. In addition to participating in local philanthropic and community activities, several Pakistani-American organizations help raise funds for schools, hospitals and other human welfare activities in Pakistan. We are poorer than the average US resident. Younis: "We are poorer than the average US resident." First, it's not average....it's median....the two are very different. 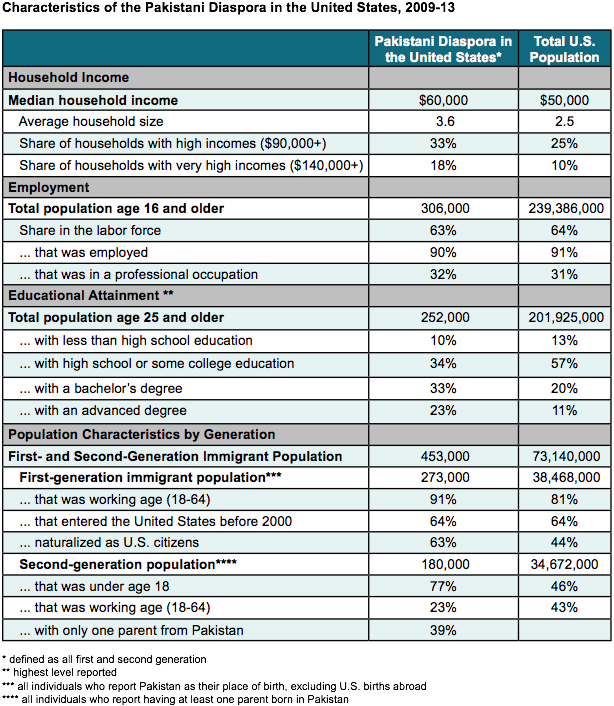 Average per capita for Pakistani-Americans is probably much higher because of higher percentage of high-income Pakistani-American households. Second, household income is a better indicator of wealth or poverty than individual per capita income. Why? Because the biggest expense is housing and families with children do not pay significantly more for it than those without children. Third, the percentage of high-income Pakistani-American households is significantly higher than the those of of the general US population. It's mainly because Pakistani-American working adults have higher levels of education than the rest of the population. can you compare pakistani american with other asian communities you mentioned i.e. Chinese (3.8 million), Filipinos (3.4 million), Indians (3.2 million), Vietnamese (1.74 million), Koreans (1.7 million) and Japanese (1.3 million). Rafay: "can you compare pakistani american with other asian communities you mentioned"
American Hindus are the most highly educated with 96% of them having college degrees, according to Pew Research. 75% of Jews and 54% of American Muslims have college degrees versus the US national average of 39% for all Americans. American Christians trail all other groups with just 36% of them having college degrees. 96% of Hindus and 80% of Muslims in the U.S. are either immigrants or the children of immigrants. However, both Hindus and Muslims are at the bottom in terms of educational attainment measured across the globe. 41% of Hindus and 36% of Muslims have had no formal schooling. Hindus have the widest gender gap in education among all religions in the world with Hindu women trailing Hindu men by 2.7 years. What is the reason why Indian Americans are so much higher than everyone else? Ashraf: "What is the reason why Indian Americans are so much higher than everyone else?" Combination of age and education levels. Indian-Americans are older, better educated and more likely to be in professional occupations. 69% of Indians vs 63% of Pakistanis age 16 or older are in the work force. 44% of Indians vs 23% of Pakistanis age 25 or older have master's or Ph.D. degrees. 50% of Indians vs 33% of Pakistanis age 16 or older are in professional occupations. But it's not necessarily a good thing for India. It would be better if India could use more of their talents at home rather than lose them to the United States.
" But it's not necessarily a good thing for India. It would be better if India could use more of their talents at home rather than lose them to the United States." So Pakistan does not require the "Doctors" who are working in USA? Are they having enough of them? Why is it different for India? 19640909rk "So Pakistan does not require the "Doctors" who are working in USA? Are they having enough of them? Why is it different for India?" Pakistan does need many more doctors to care for its people as does India. It's a question of degrees. India can afford to lose its doctors even less than Pakistan. The Deferred Action for Childhood Arrivals program – an Obama-era initiative providing relief from deportation to more than 800,000 undocumented young people, including more than 7,000 Indian Americans – could be repealed by President Donald Trump as early as this week. The repeal of DACA could make recipients of the program immediately eligible for deportation. It could also strip them of their work permits and rescind in-state tuition for undocumented college students. The program also allowed its recipients to obtain social security numbers. A study issued in January by the CATO Institute – a libertarian think tank – estimated that deporting all 800,000 DACA recipients – also known as DREAMERs – would cost the federal government $60 billion, and reduce economic growth by $280 billion over the next 10 years. “These are American children,” said Rep. Joe Crowley, D-New York, in an impassioned press call with reporters Aug. 31. “Eighty percent of Americans support DACA, and keeping these DREAMERS right here where they belong,” he said, noting that Trump has promised compassion for undocumented children on several occasions after he was elected to office. “They’re not here for hand-outs, they’re not here to harm, they’re here to contribute to our country,” said the congressman, who represents the Queens and Bronx neighborhoods of New York, both which host a large immigrant population. “We cannot send these children back to the country of their birth,” he said, noting that many DREAMERs arrived as young children, and do not know the language of their native countries. According to U.S. Citizenship and Immigration Services latest statistics – collected until March 31 – an estimated 7,028 undocumented Indian American students are DACA recipients, many who arrived as young children with their parents and have never been able to return to the land of their birth. India ranks 11 amongst the top countries of origin for DACA students; 7,881 have applied for the program. More than 17,000 are eligible, according to data from the Migration Policy Institute. Pakistan ranks 22nd in countries of origin for DACA recipients: USCIS reports that 3,476 applications have been accepted to date. There are 519,000 Pakistani-Americans as of 2015, according to Pew Research. The U.S. Asian population grew 72% between 2000 and 2015 (from 11.9 million to 20.4 million), the fastest growth rate of any major racial or ethnic group. By comparison, the population of the second-fastest growing group, Hispanics, increased 60% during the same period. Population growth varied across the 19 Asian origin groups in this analysis. Roughly half of the 19 groups more than doubled in size between 2000 and 2015, with Bhutanese-, Nepalese– and Burmese-origin populations showing the fastest growth over the period. Meanwhile, Laotians and Japanese had among the slowest growth rates among U.S. Asians in the past 15 years. No single country-of-origin group dominates the U.S. Asian population, but the largest groups are of Chinese, Indian and Filipino origin. As of 2015, 24% of Asian Americans (4.9 million) were of Chinese origin, the largest single origin group. The next two largest origin groups are Indian-origin Asians, who accounted for 20% of the national Asian population (4.0 million), and Filipinos (19%, or 3.9 million). Those with roots in Vietnam, Korea and Japan easily clear the 1 million mark as well. The remaining 13 groups in this analysis account for just 12% of all U.S. Asians. Out of the total Pakistan’s overseas workforce, 27 per cent have jobs in European countries, revealed statistics shared by Ministry of Overseas Pakistanis and Human Resource Development with the lawmakers in the Senate. After Saudi Arabia, United Kingdom caters to the largest overseas Pakistanis followed by Italy, France, Germany and Spain. In response to question of senator Rozi Khan Kakar, the ministry stated that presently around 9.08 million workforce is living/working abroad, out of which, 2.43 million got job opportunities in around 25 countries of Europe. UK at the moment has provided jobs to 1.7 million Pakistanis. Saudi Arabia continues to be the favourite destination of Pakistani workforce with 2.6 million workers. United Arab Emirates is at the fourth place in the list with 1.6 million and United States fifth with 900,350. In Europe, Italy is providing jobs to 119,762 Pakistanis, France 104,000, Germany 90,556, Spain 82,000, Greece 70,002, Norway 38,000 and Netherlands 35,000. Turkey is providing jobs to only 557 Pakistani workers while China has accommodated 14,355 Pakistani workers. Chile is providing jobs to 760 Pakistanis and Cuba has given job opportunities to 600 Pakistanis. Afghanistan provided jobs to 71,000 Pakistanis and India 10,000. Iran has provided jobs to 7,065 Pakistanis. Currently, 120,216 Pakistanis have been provided jobs in Malaysia and 65,000 in Thailand. Libya provided 12,008 Pakistanis jobs, Iraq accommodated 4,709 and Yemen 3,024. Russia gave jobs to 3,560 Pakistanis, stated the statistics. The reply also contains that 19 Community Welfare Attaches are posted in Pakistan’s missions abroad in the countries having a sizeable concentration of Pakistanis to provide them certain facilities. These facilities include, issuance of passports, provision of assistance in implementation of Foreign Service Agreement which is made between employee and employer and some others. Majority of the Pakistanis residing in Estonia constitute highly qualified and skilled people including engineers and software experts, said Chairman Pakistan-Estonia Association (PEA) Dr Yar Mohammad Mughal. In a meeting with Enn Eesmaa, the first Vice-President of the Estonian Parliament at the parliament House in Tallinn, Mughal said that the total number Pakistanis in the country is 200 people and vast majority of them are highest degree holders. 30 % of the community is highly skilled engineers and software engineers who obtained jobs after completion of their education in Estonia, a country of 1.3 million in the Baltic area. 20% are either self-employed or have odd jobs. The rest are mostly students of PhD, Masters and Bachelors degree programs. Dr Yar also told the leading Estonian lawmaker about the cultural activities of Pakistani community in different cities of Estonia. Steps and objectives of Pakistan Association Estonia were highly appreciated by Mr. Enn Eesmaa. He emphasized on further efforts for enhancement of ties between Pakistan and Estonia. Dr Yar Mohammad, who is assistant professor at University of Tartu, Estonia has started his efforts for exchange of students and scholars between the two countries and so far has achieved an agreement on exchange faculty members between NUST University of Pakistan and an Estonian university. During the meeting, the two sides agreed that educational diplomacy can be used as an effective tool in Pak-EU ties, especially Pakistan’s relations with Estonia. Higher educational institutions of both sides play a significant role to promote bilateral relations, he added. Dr Yar sad that collaborative study and research projects, joint degree, consulting contracts and others activities can be increased between Pakistani and Estonia. Mohammad Ashraf Faridi immigrated from Pakistan to the United States in the 1980s. He settled in New York City, and his family joined him almost a decade later. By then, Mohammad was earning a living driving a cab. At StoryCorps, his oldest son, Muhammad, talked about growing up as the son of a taxi driver. Muhammad Faridi (MF): You used to go to work and then come back home around 2am. So in the morning you used to send me to go clean your car. I would vacuum, take out the mats, smack them against the pole to get the dust out. And then I was maybe 14, 15, and I was doing that and a kid from the neighborhood just began making fun of me. ’Hey! Cab boy! Taxi boy!’ That’s one of those experiences that made me embarrassed. Mohammad Ashraf Faridi (MAF): At that time my financial position was no good. MF: After your 18th birthday you can get your taxi license. MF: We drove together for a couple of days. MF: You showed me the streets, bridges, everything. And I started college, and went to law school, and I was still working part-time, driving. And then I began working for a federal district court judge. The judge at that time was in his late 80s. So I used to help him carry his briefcase down. And one day, the judge called for a car service, and you came to pick him up. MF: I put the briefcase in the car. We waved at each other. And you drove the judge home. The next day the judge and me, we were having lunch. I said, ’The driver who picked you up yesterday was my father.’ The judge was very upset at me that I didn’t introduce him to you. I, at that point, never really liked talking about my family. We don’t come from Park Avenue and I was embarrassed that you drove a taxicab. But not anymore. As I grew older, I’m proud. You know, I think you’ve done a great job. MAF: The bottom line is this: I got everything in my life — my friends, my family. I am happy. MF: And in my life if I can emulate that by a fraction I would think that I’ve lived a good life. Mohammad Faridi is now a partner at NY Law Firm Patterson Belknap Webb & Tyler LLP. IMAN is a way to make Islam relevant to American Muslims, Nashashibi says, especially those searching for a purpose and a connection to a faith so often portrayed as a foreign threat on American television. For this work he was recognized last year with a prestigious MacArthur Foundation “genius” award. “We’re trying to celebrate the legacy of the spirit of a transformational, empowering, inspirational Islam that is not constantly trying to apologize and explain itself,” he says. On September 13, 2018, the US Census Bureau released some of the data from the 2017 American Community Survey (ACS). The survey reflects the U.S. population as of July 1, 2017. The immigrant population, referred to as the foreign-born by the Census Bureau, is comprised of those individuals who were not U.S. citizens at birth. It includes naturalized citizens, legal permanent residents (green card holders), temporary workers, and foreign students. It does not include those born to immigrants in the United States or those born in outlying U.S. territories, such as Puerto Rico. Prior research by the Department of Homeland Security suggests that 1.9 million immigrants (legal and illegal) are missed by the ACS. - The sending countries with the largest percentage increases since 2010 were Nepal (up 120%), Burma (up 95%), Venezuela (up 91%), Afghanistan (up 84%), Saudi Arabia (up 83%), Syria (up 75%), Bangladesh (up 62%), Nigeria (up 57%), Kenya (up 56%), India (up 47%), Iraq (up 45%), Ethiopia (up 44%), Egypt (up 34%), Brazil (up 33%), Dominican Republic and Ghana (up 32%), China (up 31%), Pakistan (up 31%), and Somalia (up 29%). - The states with the largest increases in the number of immigrants since 2010 were Florida (up 721,298), Texas (up 712,109), California (up 502,985), New York (up 242,769), New Jersey (up 210,481), Washington (up 173,891), Massachusetts (up 172,908), Pennsylvania (up 154,701), Virginia (up 151,251), Maryland (up 124,241), Georgia (up 123,009), Michigan (up 116,059), North Carolina (up 110,279), and Minnesota (up 107,760). - The states with the largest percentage increase since 2010 were North Dakota (up 87%), Delaware (up 37%), West Virginia (up 33%), South Dakota (up 32%), Wyoming (up 30%), Minnesota (up 28%), Nebraska (up 28%), Pennsylvania (up 21%), Utah (up 21%), Tennessee, Kentucky, Michigan, Florida, Washington, and Iowa (each up 20%). The District of Columbia's immigrant population was up 25%. The Coney Island Avenue strip between Avenues C and H, also known as “Little Pakistan,” will be co-named “Muhammad Ali Jinnah Way,” after the founder of Pakistan. Muhammad Ali Jinnah, also referred to as Quaid-e-Azam, is still idolized by Pakistanis today. When Great Britain left India after controlling it for over three centuries, it left a place where Muslims and Hindus were in conflict. Jinnah pushed for a separate country, a Muslim dominated Pakistan. On August 14, 1947, India was finally partitioned. But it was met with intense bloodshed and a great migration of people. Indian Muslims headed to a new free country – Pakistan, but many people were murdered along the way. Women were raped, men were dismembered, and villages were set on fire. About 15 million people were displaced and grieving. But still, Jinnah had hope. “My message to you all is of hope, courage, and confidence. Let us mobilize all our resources in a systematic and organized way and tackle the grave issues that confront us with the grim determination and discipline worthy of a great nation,” he had said in the past. To honor the man, efforts were taken by various individuals and organizations in the Brooklyn Muslim community, including PAYO for several years to get the street co-named. In fact, according to Khan, the process began before September 11, 2001. But efforts were halted after the “Pakistani community was stigmatized, marginalized, and targeted,” he said. The resolution, sponsored by Council Member Jumaane Williams, was passed by the NYC Council last week. An official ceremony will be held later this month. Khan attributes this victory to the Pakistani youth. Kashif Hussain, a community activist who ran for District Leader and lost, says his run (and the fact that he got close to 8,000 votes) may have made a difference – the community is finally being taken seriously, he said. Hussain believes it’s about time “Little Pakistan” was co-named. Sakina Halal Grill looks like your typical high-end restaurant located just blocks from the White House. During the lunchtime rush hour, many customers flock to the grill for the all you can eat buffet of authentic Pakistani Indian food. However, it's anything but just another restaurant. Beyond the delicious flavors you find, the warm Chai Latte or fresh lemon water, you would never know that homeless people are walking in and out to experience the same thing paying customers are.